Petaling Jaya: Property developer See Hoy Chan Holdings (SHC) expects to reap the benefits of the RM160 million makeover of its 1Utama Shopping Centre in Bandar Utama by next year. The upgrade, which comes some 16 years since the building was first constructed, will see SHC - the developer and owner - enjoy a 35 per cent jump in revenue in 2012 as it begins to manage both the new and old wings. 1Utama's old wing was managed by Aeon Co (M) Bhd, which operates the Jusco stores for 15 years until August 2010. SHC director Datuk Teo Chiang Kok said both SHC and the tenants will pump in an equal amount of investment to spruce up the building and the outlets, an exercise which is expected to be completed by November this year. 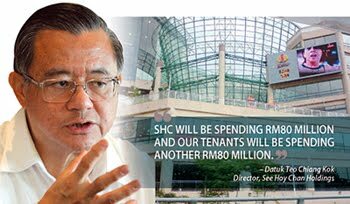 "SHC will be spending RM80 million and our tenants will be spending another RM80 million," Teo told Business Times in an interview at the mall. The construction cost of the old wing, built 16 years ago, was RM89 million, excluding the land cost. This makeover will see the two-million sq ft 1Utama old wing increasing its rentable area to 780,000 sq ft. The three-million sq ft new wing has a 1.2 million in nett lettable area. The mall will have the TGV Cinemas relocated one floor up, with an additional five more cinemas to make 12 cinemas in total. Apart from the facade and interior, 1Utama has just completed connecting the mall to its newly opened 1 First Avenue office tower. The ramp at the entrance, which leads to the third floor parking, will be removed, as it is obstructive. The office car parks in 1 First Avenue will be freed up on weekends so that the entire mall will be able to accommodate over 10,000 cars. Jusco, an anchor tenant, will occupy 320,000 sq ft and is expected to open at its new location within the mall by August this year. Subsequently, two major Japanese retailers will take over the space where Jusco's supermarket and Jusco's deli are now located. These two new tenants are set to start business before the end of the year. On the performance of the mall, Teo said: "Traffic count to the shopping centre has been increasing year-on-year. In 2010, it rose 13 per cent over 2009". While the old wing is experiencing a drop in shopper traffic, traffic to the new wing has risen. Teo views this as a positive sign, as previously, there were patrons who either visited the new wing or old wing only. When asked if the mall may be extended further given the availability of land where it now sits, Teo said that 1Utama has already reached an optimal size for a suburban mall. "Walking from one end to the other in itself is 1km," he said.